I used CPS Sketch 114 as my inspiration for creating today's card. I did away with the circles on my panel, and added the sentiment from God Bless America and two red stars. I stamped the Flag from Our Daily Bread Designs God Bless America in Black on Watercolor paper, then colored it using the Marker Watercoloring Technique. Once dry, I cut my circle with my Big Shot and Spellbinders Dies, layering the colored image onto a Blue Circle Panel, then onto my base card. I just love the size of the Flag (3-3/4" x 4-7/8") it's perfect for background panels. That is a gorgeous card, Lisa!!!! OMG. I love this stamp and I love how you made it look like light is shining through the flag!! You're killin' me! That card is gorgeous! I was JUST ABOUT TO WRITE EXACTLY WHAT "LYDIA" said, then I noticed her post! Doh! But I agree, it looks like a REAL flag that is illuminated by a light source BEHIND the image: beautiful! 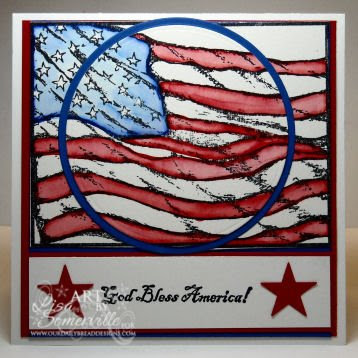 Lisa, I so love that flag - it looks great on here and I love the way you used the CPS sketch.